Looking for Dunes West Golf River Club wedding photos on the internet for that special wedding photographer to capture your day can at time be very difficult. How do you has a wedding client narrow down the perfect artist to capture your day. Well wedding photography is not about just day light that we refer to ambient light, a talented wedding photographer must also be able to capture your wedding during the night, whether they are shooting in tungsten lighting, or using strobes, known as flashes, there are so many ways you can do this, knowing that talent takes many years of knowledge, and know how. For me when I am at a reception, I have many different strobes that I have dialed in to capture different type of affects in a specific wedding photograph. Most of you would say if flashes all put out the same light then they give you the same result. I am here to tell you that you are wrong. In todays technology, you can set you strobe with a certain amount of power, use different type of diffuser, or grids and sometime that perfect gel, and get amazing results. 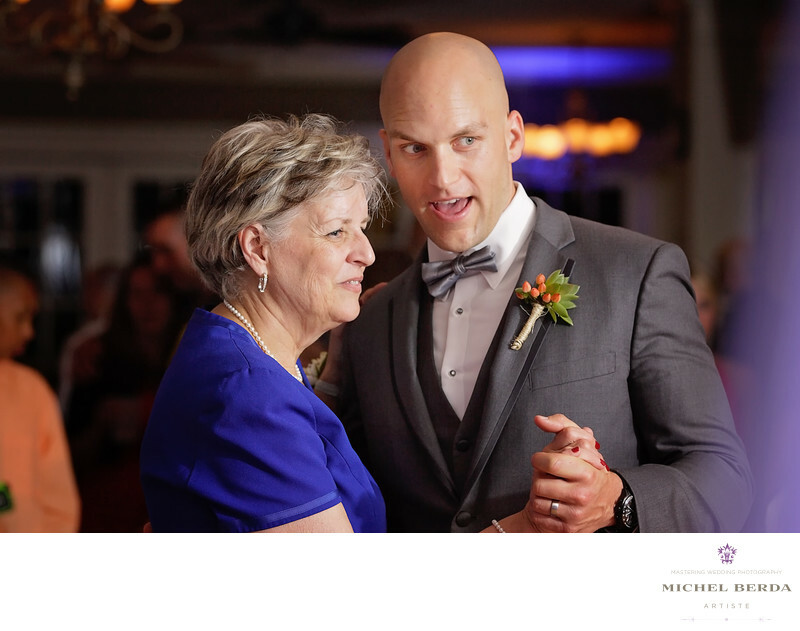 Okay I am getting a little technical here, but my point is has this Dunes West Golf River Club wedding photo of the groom dancing with his mom, look at where the light falls the details that this image has and how knowing your craft very well, can give my clients the perfect wedding image.